Yay! This is one of those books that I “evangelized” for all the time about 5 years ago, and it still makes me happy when people discover it! Maybe I’ve had enough distance for a re-read. Jesuits in Space? I had heard of this book before but had no idea that’s what it was about. Very curious now. I heard Mary Doria Russell speak at the GE Bookfest a few years ago and, although she was there to speak about Doc, she did go into a little detail on those Jesuits in Space. It’s been on my to-read shelf ever since. I really need to make some time for this one. One of my fave books ever – so glad you got to read it! Does anyone else think that Avatar (the movie) completely ripped off the space beings in this book? A sci-fi book with Jesuits. Yeah…it sounds weird and I could see how you thought it was a comedy, but it won you over quickly. Will keep this book in mind when I want to read something different. Well, there are SO many things to get around to. 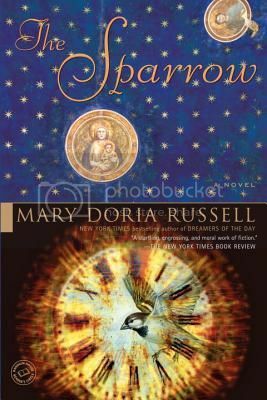 Please read the sequel to The Sparrow. It is just as good. Also Russell’s Threads of Grace is a wonder. It’s about a Jewish lawyer and resistance fighter in Italy during World War II. Central in his struggle is keeping alive the woman he loves (unrequitedly as she is married to his friend) . He infiltrates the Nazi administration. I read her most recent book, Doc, so I don’t doubt in the least that those two are wonderful. I may even own Thread of Grace. Yay! This is one of my all-time faves. And I agree about reading Children of God. It completes this story more fully than the way the first book leaves off, if that makes sense. I’m so glad to hear you liked it. Oh my gosh, the fact that you went in thinking you were reading a comedy totally cracks me up. I’m so glad you liked it anyway! It’s one of the few books that I remember to recommend, years after having read it. I should read her others (besides the sequel, which I also recommend), I sort of forgot to check on whether she’d finally published again. Bahaha, this is so not a comedy. I can definitely see how you got that impression, but I’m glad you still liked it!